So, these little dreams came to me as I was trying to decide what kind of cupcakes to make for a party later on in the evening. I knew I wanted to use Italian meringue or seven minute frosting for the topping. I just didn’t know what kind of cupcake to put underneath it. Then it dawned on me, HELLO! 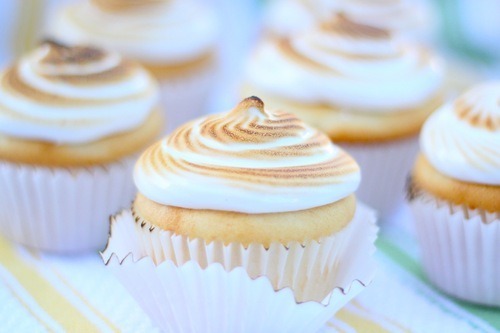 Make white cupcakes, fill them with lemon curd, frost them with Italian meringue and then torch the top! 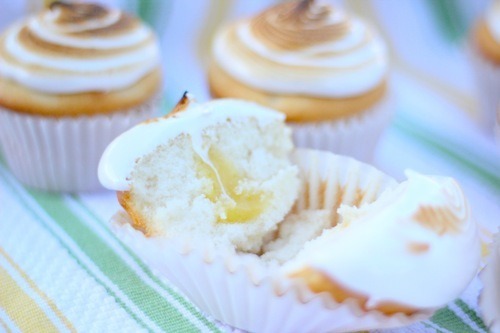 And this is how the Lemon Meringue Cupcake came to fruition. The tart and silky lemon curd is a perfect paring with the spongey white cake and marshmallowy smooth frosting. Zest lemons and then squeeze lemons to get roughly 1/2 cup juice. In mixing bowl, mix sugar and zest together. Then add butter and beat until well combined. Add eggs 1 at a time. Beating after each addition. Then add lime juice and salt. Pour mixture into saucepan and cook over low heat, stirring constantly, until thickened. About 10-15 minutes. Store in clean container and in the fridge to cool. 1 Duncan Hines or Betty Crocker white cake mix. Follow directions on box and also add 1/4 cup sour cream. Baking times on box apply. Let cool on wire rack. In small saucepan heat 1-2 inches of water just to simmering. Put bowl over top of water in saucepan. Making sure simmering water doesn’t touch the bottom of the bowl. And beat constantly, using electric beaters until mixture thickens to stiff peaks. Remove from heat and add 1 tsp vanilla. Spoon cooled lemon curd into a pastry bag with bismark filler tip. Or use any other plain narrow opening tip you may have. And press gently down into the center of each cupcake, then squeeze some of the lemon curd into each. Frost top of each cupcake with a generous amount of the seven minute frosting and then use a kitchen torch to slightly burn the tops. If you don’t have a kitchen torch, turn your oven broiler on high and put the oven rack 1 from the top. Put the cupcakes on a cookie sheet and into the oven. Do not leave them. Watch closely so the frosting doesn’t melt. Take them out a soon as you start seeing slight golden.